Blackmore Vale Lions present a cheque for £1,500 to the Andrew Simpson Sailing Foundation, the charity set up in memory of, and inspired by, Olympic Gold medallist, sailor Andrew ‘Bart’ Simpson. The ASSF honours the life and legacy of a sailor who was passionate about encouraging and helping others fulfil their aims. 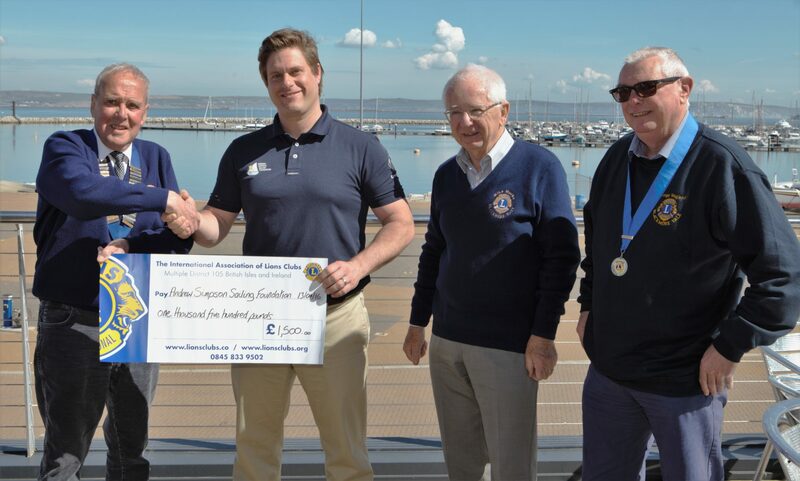 The money donated was part of the proceeds of the annual Blackmore Vale Lions’ half marathon and the cheque was handed over at the Foundation’s headquarters at the Weymouth and Portland National Sailing Academy. The charity’s Chief Executive Officer, Richard Percy received the cheque from Blackmore Vale Lions President, Ian Simpson, who was accompanied by fellow Lions, Vice President George Wagland and Mike Marks. The Blackmore Vale Lions stated that they are very pleased to present this cheque to the Andrew Simpson Sailing Foundation as this type of beneficial aid fits exactly into the type of service to the local community that Lions Clubs around the world take great pride in supporting. We wish the ASSF and their team of volunteers every success in their quest to maintain this vital service link for young people both in Dorset and around the world. 375 runners of all ages took part in the 24th half marathon organised by the Blackmore Vale Lions Club with the valuable cooperation of Bishops Caundle Parish Council, All Saints Primary School, Bishops Caundle Village Hall Committee and Bishops Caundle Football Club.